On her first day on the job, the newest member of the Williamson County Sheriff’s Office bounded over a black suitcase. Remi — a 2-year-old black Labrador — had discovered a small memory card inside the piece of luggage. “Good job, Remi,” said Detective Lee Eaves, her handler. He chucked a red ball across the room as a reward for her search. Remi is the first electronic detection dog attached to a law enforcement department in Tennessee. The pup specializes in sniffing out electronics, such as cell phones, tablets, flash drives and SD cards. She started with the department May 18. Remi and her handler will assist investigators on the Internet Crimes Against Children Task Force. The department established the force last year. 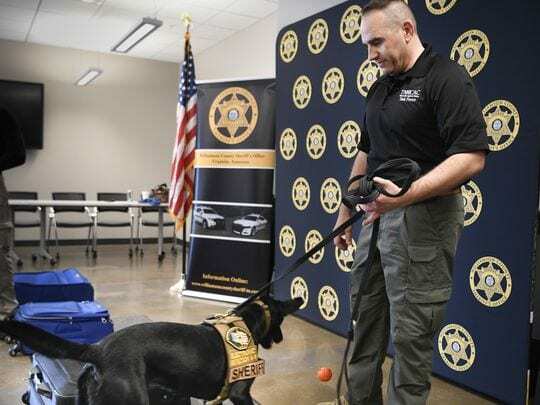 Remi will also help search for contraband cell phones at the Williamson County Jail and be featured in presentations about internet safety and cyber bullying at the county’s schools. Remi came at no cost to the taxpayers, Sheriff Jeff Long said. Nashville K-9 purchased, donated and trained the dog. Remi and Detective Eaves began training at Nashville K-9 in December 2017. She joins six other dogs in the department’s K-9 unit. Nashville K-9 provided a certification for Remi that included searches in suitcases, vehicles, furniture, clothing and jail cells. Copyright © Nashville K-9. All rights reserved.